Outdoor enthusiast doesn’t begin to describe you. You practically live outdoors. As soon as camping season rolls around, you’re ready with your tent and sleeping bag in the car and your stove packed in its carry bag. You want nothing more than to eat, sleep, and breathe in the nature around you. But campsite cooking can often get in the way of your experience; it’s either too bland or too difficult. We’re here to spice up your campsite menu. Use these genius hacks to make cooking a delicious touch to your weekend plans instead of a huge stress. For any given meal, there is usually some amount of chopping, dicing, peeling, or mixing involved. Do yourself a favor and take care of all this prep work at home. Then pack it into bags for the road. Make some pancake batter or scrambled eggs (or both) and bring it in an old condiment bottle. You can squirt it out onto your griddle when it comes time for breakfast. Hang dishes up when you’re not using them or after they’ve been washed. You can use a mesh bag or carabiners hanging from a rope. If you have to prepare some food at the campsite, bring one of our flexible cutting boards with you. It’s lightweight, flexible (per the name), and is perfect for on-the-go prep work. Bring aluminum foil, preferably the heavy-duty kind. You can use it to cover food, cook directly in the fire, save on clean up, and more. Bring plenty of it. Chill all of your perishables in the fridge before it’s time to leave. Placing chilled items in the cooler (rather than room-temperature items) will keep things colder for longer. If you’re camping for several days, consider freezing some of your meat. Package everything inplastic, zippered bags to prevent it from getting wet. If you have a big group, pack a cooler for drinks and a cooler for food. The drinks cooler will probably get opened more often and, therefore, warm up faster. You don’t want your food cooler to lose its temperature. Pack what needs to stay coldest at the bottom, on top of your first layer of frozen water bottles or ice. That includes your raw meat. 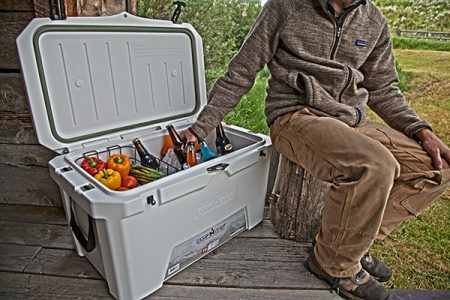 Fill your cooler to its capacity to keep things cool. Empty space heats up faster than chilled food items, so if there’s a lot of free space in your cooler, it will have a harder time maintaining its temperature. Make sure you set your cooler out of direct sunlight, and avoid opening it more than is absolutely necessary. A cast iron skillet can easily cook breakfast, lunch, and dinner if you choose the right recipes. Bring one versatile piece of cookware instead of lugging along a ton of dishes. Ditto for a Dutch oven (see above). It’s versatile and perfect for feeding a group. Bring a pan scraper to clean off your cast iron cookware at the campsite between meals. You can save the deeper cleaning for when you get home. Cook with cast iron over an open flame, on a stove top, or with charcoal briquettes. Bring a lid lifter, heat guard gloves, an old potholder, or a towel to handle the hot cast iron while you’re cooking. Test your skillet or Dutch oven’s heat with a drop of water on the surface. If the water sizzles and balls up when it hits the surface, you’re ready to cook. Use Dutch oven liners to save on clean-up time. Use a stove that has enough power to hold up in outdoor conditions. The Pro 60X is perfect for large groups, while the smaller Everest is good for individuals or couples. We have stoves to fit every group size, each with the power to cook what you love. Test your stove before you leave home. Nothing is worse than setting up your camp and getting ready for dinner, only to discover that your stove doesn’t want to light. Make sure your stove is clean and your propane tank contains enough fuel. Mix and match accessories to create the camp kitchen you want. Bring a BBQ Grill Box for burgers or kabobs. An Artisan Pizza Oven is great for baking pizza, desserts, and breads. Griddles make a mean breakfast. You want it? We got it. Use a carry bag for each of your stoves and accessories. That will make packing and unpacking at the campsite much easier. 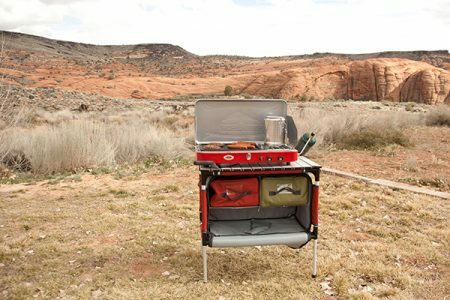 Give yourself some extra prep or eating space with a portable camp table like one of these. Dutch oven potatoes are perfect for a big group of people. Prep for your trip by chopping up the potatoes and onions before you leave. Then just throw everything in your Dutch oven, and you’re ready to go. Bake cinnamon rolls in your cast iron skillet for breakfast by covering with tin foil. Either make the dough beforehand, or bring a pre-made tube. Use your Dutch oven to cook up some biscuits and eggs. Scramble your eggs in the oven, and use the lid over some hot coals to bake the biscuits at the same time. Pan seared steak is a hearty, delicious way to end a day outdoors. Plus, you can make it over an open fire with your cast iron skillet. Tired of the same old s’mores? Try some crazier combos like our peanut butter slam s’more or our salted caramel s’more. 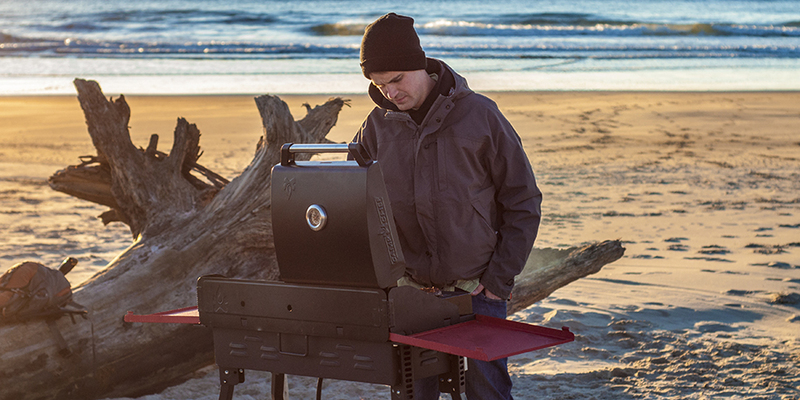 Campsite cooking doesn’t have to mean limited options. With some trusty cast iron and a little creativity, you can cook what you love to eat, no matter where you’ve set up your tent. If you have any other awesome camping hacks, we’d love to hear them! Share in the comments below your favorite campsite cooking tip. Great ideas. One great way to clean your cast iron after a meal is to use creek gravel to scrub them clean then reheat and coat with oil. I have one of your excellent dutch ovens (which is why I’m here) but sadly cannot easily get your other products in the UK. But I’m enjoying picking up some tips. Thanks. I love my Camp Chef (Browning) two burner stove , but always have issues when the wind picks up. Other than blocking the wind by moving the stove or placing something between the stove and the wind what suggestions/products do you recommend? Hey Chris! If you aren’t already, be sure to use a windscreen with your stove. You can also try closing the air vents down as much as possible before you get a yellow flame. Some of our customers wrap aluminum foil around the base of the stove, around the legs, to prevent the wind from blowing underneath the burners. We hope some of those ideas help! Two things I do to make the most of my Pelican (purchased before Camp Chef had coolers) cooler’s efficiency is to put 2-3 gallon frozen gallon jugs of water in it the night before to precool the cooler. I also bought this stuff called Kooler Gel that you mix with water and pour into containers. I use the smallest Gatorade bottles. Freeze them for 48 hours. They stay frozen a lot longer than ice. When cooking with my Camp Chef deluxe dutch ovens and skillets I depend heavily on my Camp Chef dutch ove table with side shelves. It makes life so much easier. I have a 2 burner Pioneer camp stove. It didn’t come with a wind screen. I was going to buy one online, but my model number wasn’t listed as being compatible. Any ideas? I’m trying to find your Ultimate Dutch Oven everywhere but it’s out of stock anywhere I look. Is this model coming back soon? We have actually discontinued that item. You may want to check out our Deluxe Dutch oven if you’d like something similar. You suggested prepping potatoes before the trip. How do you keep them from turning brown? Great question, Scott! If you keep them covered in water, they won’t turn brown. You can keep them like this for up to a day.